Our friend Tori Swaim is back, guest posting with more tips on staying on budget while still decorating your nursery on trend. The gorgeous bedding from her companies New Arrivals, Inc. and Three Wishes Bedding Co. is featured below. We always appreciate her expert advice and awesome tips. Thanks, Tori! Decorating a nursery can be an expensive endeavor, but there is no need to break the bank! Today’s mom wants to create the nursery of her dreams without spending a small fortune. We would like to show you how you can decorate your baby’s room with on trend and budget-friendly décor items that you can find online or at your local retailer. Children’s room accessories in the latest trends can be found at Target, Homegoods, World Market, IKEA and TJMaxx. Here are some of the trends we’re featuring in our latest bedding collections. Sweet floral prints are making a comeback in the nursery! Traditional floral prints accented in new color trends are a fun twist on this classic style. Bring out the color in this soft fabric by adding in pops of coral, aqua and gold with a rug, wall décor, lamps and other room accents. The woodland trend for nurseries is still as hot as ever—pallet walls, rustic wood, faux taxidermy wall décor and more! Adorable teepee patterned bedding and rustic décor accessories give this room its outdoor-inspired look. Our Buck Forest Mist bedding collection in gray and mint is our #1 selling set for boys. Anything nature-inspired can be the perfect accent to this popular theme in the nursery. The swiss cross pattern is showing up in all rooms of the home, including the nursery! It is a fun pattern for a baby’s room and can be found in a variety of colors. Look for modern accents in bold colors to coordinate with this theme. Coral was hot in 2014 and continues to be a popular trend in the nursery in 2015. Gray is still a favorite neutral color that can go with a traditional or modern styled room. The coral chair, elephant and throw pillow bring out the color in this fun coral and gray crib bedding. 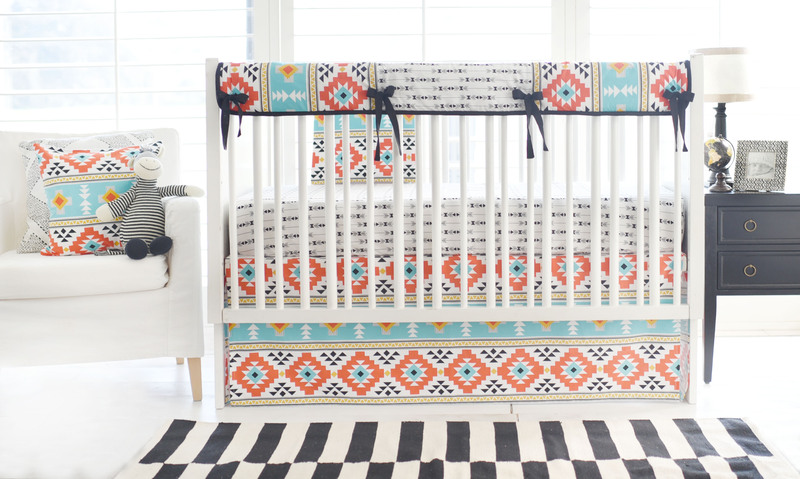 Tribal styled designs have exploded and are a perfect fit for the nursery. Fun Aztec room décor items can be found online and in stores everywhere. Go bold with black. Look for wall décor, rugs and accent pillows with arrow or adventurous patterns to coordinate with your western-inspired nursery. Gold, coral and aqua continue their popularity in 2015. Colorful accents in these bright hues will bring out pops of color in the room. The popularity of a nautical nursery never seems to fade, and whimsical maritime-inspired room accents are easy to find. Anything with anchors, rope, ships or whales will accentuate this favored theme for the nursery. Before purchasing anything on a website, first check to see if any discounts are available for following them on social media or for signing up for their email list. Most websites offer anywhere from 5% to 20% off your first order for simply adding your email address to their mailing list! Swapping is the new shopping! Websites like Swap.com, Freecycle.com, and ThredUp.com have hundreds of people looking to exchange items, including lots of baby stuff. You can also check out your local Craigslist or Facebook Swip Swap to find used nursery items. Pre-owned items may need some refurbishing but will be much less expensive than brand new! Between the ages of 18 months and three years, your toddler will make the transition from his/her crib to a big kid bed. Keep this in mind when purchasing items for your nursery. Decorating the room with décor that will easily grow with your child will save you from spending too much as he/she moves from the crib to a bed. For more great budget-friendly advice from Tori, check her other posts here and here. I really like the Buck Forest Mint Crib Bedding Set!!!! I bought mint accents such as a lamp and rug and painted one wall a light mint in the nursery and bought the buck forest boys crib set from the boys depot! I found some really unique accent pieces on etsy. I wish I had know about etsy years ago.